When it comes to art, PA has it all! Not only does Pennsylvania offer awe-inspiring museums, but it also offers some awesome PA public art! Find here all the most unique, interesting and creative art spots that PA has to offer. See Sculptures, Fountains, Museums & More! When it comes to seeing beautiful public art in Philadelphia, Fairmount Park is the place to go. Located on JFK Boulevard, Fairmount Park holds a large variety of sculptures, fountains and museums. Encompassing 9,200 acres, Fairmount Park includes 63 neighborhood and regional parks that all house beautiful public art. The many sculptures that are available to view at any time include the Washington Monument, Seawead Girl, the Swann Memorial Fountain, and much more. Not only does Fairmount Park offer great public art, but they also offer many performances and events. Whether you're looking to relax in the park with a book, or to go on an informative tour, you can do it all at Fairmount Park! 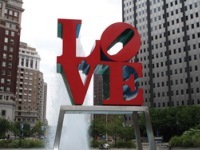 Go on a Personal Guided Tour of Philly Public Art! If you're interested in checking out the amazing Philadelphia public art, but don't know where to begin, then Museum Without Walls is definitely the place for you! An interpretive audio program, Museum Without Walls provides downloads of nearly 100 voices at 35 stops along the Benjamin Franklin Parkway and Kelly Drive. You can gain access to the audio recordings through your smart phone or by calling their phone number, and you can also print a map and guide. The wonderful public art works that you will see during your tour include the following statues: LOVE, Rocky, Joan of Arc, the Shakespeare Memorial, Stone Age in America, and much more! Take a Tour & See all the Best Mural Painitings! 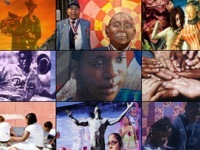 The largest public art program in the United States, Mural Arts Center offers a variety of programs, artist opportunities, and inspirational public art. Created in order to defer artists from destructive graffiti and toward constructive mural painting, Mural Arts Center's mission is to unite artists and communities throughout Philadelphia. A variety of tours are offered that show you all the best spots to see beautiful murals throughout the city. Consider taking one of their great trolley tours, train tours, personal car tours, walking tours, and much more. 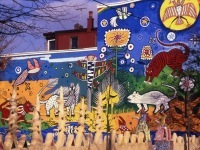 No matter how you want to do it, make sure to check out these unforgettable mural paintings in Philly! Put a Special Message in the Sky! As a city that promotes unique art and culture, it is no wonder that Philadelphia is the home of one of the coolest interactive artwork in the country: Open Air. 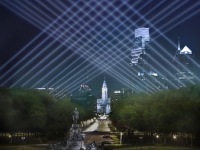 Through their website, you can record a message and rate other entries; those with the top ratings will be play-back over the Benjamin Franklin Parkway using powerful robotic searchlights reacting to the voice's frequency and volume. You can even send your messages through your mobile app that can be sent through live during the show. 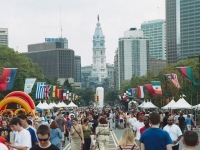 Take part in this state-of-the-art display of art, technology and creativity by stopping by the Benjamin Franklin Parkway from September 20 through October 14! Beautiful Mosaics & Wall Murals! Presenting an array of public art, the Village of Arts & Humanities offers a testimony to the role that art-making can play in bringing community together and the restoration of urban landscapes. This program offers a variety of wall murals and parks that glimmer with giant mosaics that represent mythical creatures. Not only does the Village of Arts & Humanities offer art for the enjoyment of the public, they also offer youth programs, projects, workshops, events, and more resources for artists and people who want to get involved in their community. The Village of Arts & Humanities promotes both art and community involvement and development - stop by to check it out for yourself!